Which are the best hookah hoses that you can buy in 2019? What Makes the best Hookah Hose? Shop the best hookah hose today! “What is the best hookah hose that I can buy?” is a question that many ask. But what is the real answer? It may be a nammor hose or even a metallic hookah hose! We are going to find the real answer about the best hookah hoses but also for almost any “best” question. There is not really a “best” product when it comes to anything nevertheless Hookahs or hookah accessories. Everything is up to the preference of the individual person. However, if you ask us, what is the best hookah hose, based on your opinion? We could definitely give out a helpful answer. Here is a breakdown of the most popular hookah hoses with the best reviews. 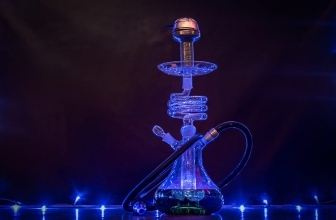 Silicon hookah hoses have been on the market during the couple last years or so. Everyone seems to love them. You have to be sure however that you are buying a real, top quality product made of silicon and not a fake/ low-quality product. All the products that we list here are made of high-quality medical grade silicone that is frequently used in medical products or laboratories. Why should you choose a silicone hose? Silicon hoses are known to be resistant to flavor ghosting. 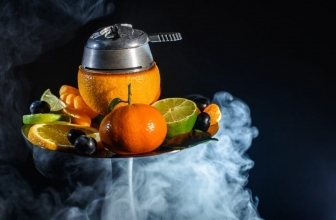 In other words, it means that silicon hookah hoses are more likely to give you a better and fresher taste each individual time that you chill and relax your shisha session. Also, silicon hookah hoses are known to be a lot more flexible, lighter and easier to store than the other types of hookah flavors. 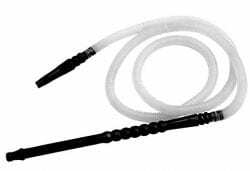 What are the best silicon hookah hoses? One of the leading hookah hoses that allow excellent airflow can be kept easily clean and it is made of great quality silicon and solid aluminum. 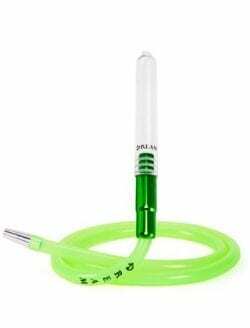 This is a budget item which is great for those who are interested to try silicon hoses. We would highly recommend that you spend few extra bucks and go with a more quality product. This hose, however, is great for beginners and has nothing to envy from some more expensive products. The D-Hose Dream Hose is composed of a high-grade silicon (as most of the D-hose hoses). It is 72″ long and comes with a glass handle made from 4mm laboratory grade glass. This item is dishwasher safe which is very convenient. It is our favorite choice and we highly recommend you to go with the Green Color (Which looks amazing). 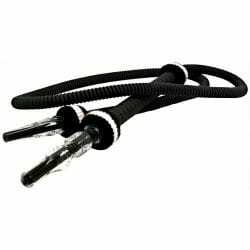 Nammor Hookah hoses are often considered as the best hookah hoses by many. 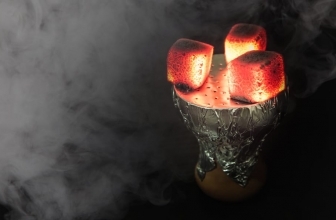 These items are built for the most demanding shisha smokers. Nammor hoses are made with a wide bore which allows unrestricted air-flow making it the optimal hose for huge clouds and smooth inhales. Nammors are washable, resistant to ghost flavoring and easy to clean. 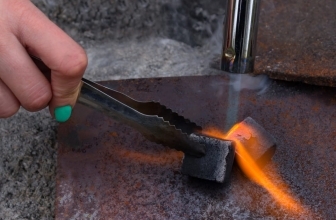 Many choose to upgrade their Nammor hose with an Ice Hose tip. The Ice tip needs to be put in the fridge for a couple of hours and then placed into the place of hose tip. This makes your smoking experience really chilled. We like using the ice tip on almost all of our sessions. This Nammor Hookah Hose is one of the best hookah hoses in the world. This item is washable and put together without any metal so it is never going to rust or degrade. The diameter of the bore is the optimal to experience a smooth session while at the same time produce huge clouds. 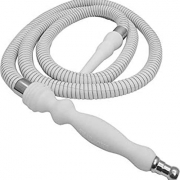 The Cobra AGER washable KYNMR hookah hose with a long handle is impressive! We truly believe that it is one of the best hookah hoses available on the market today! 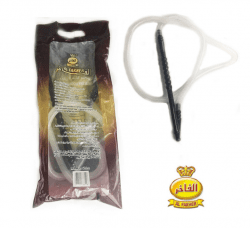 It is even considered as the UK answer to the American Nammor and Razan hookah hose. The mouthpiece od this hose is removable like many of the alternative choices. 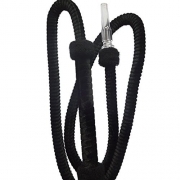 This washable long hookah hose is universal and can be fitted on types of hookahs. 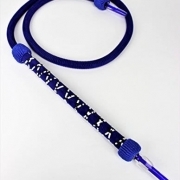 Tonic hookah hoses are affordable and available in many colors. The look of these hoses is impressive since they are glowing in the dark. 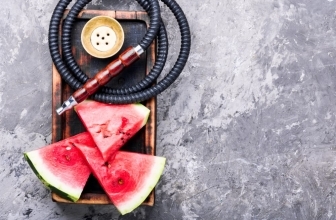 The benefits of this disposable hookah hose are that it is Hygienic and free from Microbes and Bacteria that are often accumulated in traditional hoses. 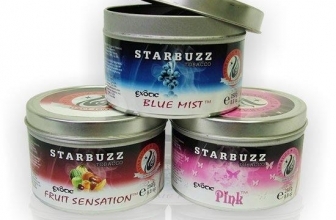 It is produced from premium quality plastic and it gives the most natural taste of flavor that a hookah hose can give. If the user decides to use it more than once, it is important to clean it with water and soap. If you want a hookah that will last you long-term then you should consider buying the metallic hookah hoses. The metallic hookah hoses are more durable than normal hookah hoses and rarely break or go wrong. The only drawback of metallic hookah hoses is that they are heavy. Some people want small gauges while others prefer the large gauge. The bigger the gauge the easier is the drawing of hookah smoke! Choose yours wisely! It is very important that the hookah hose can be easily washed! Make sure before you buy your best hookah hose you check the washability of it as it is a very important factor! Technically colors are not very important however all of us have different tastes! Choosing a bright color is always my favorite choice when it comes to buying a new hookah hose. I personally prefer bright green neon hookah hoses but again, that’s my personal choice. The longer the hookah hose the easier is for you to share it with your friends. Also, long hookah hoses are better for being able to have a comfortable seat at a spot. Last but not least is the handle of the hookah hoses. Hookah hose handle is very important because having a good grip is always important!